A skylight may seem like a sustainability no-brainer. It provides daytime lighting year-round, and cheap solar heat in the winter. But green skylights must be carefully designed and installed, or they could waste more energy than they save. The US Department of Energy (DOE) estimates that skylights can contribute to heat gain and loss by 40 percent more than other windows. However, there are ways to maximize the energy efficiency of skylights. Perhaps the greenest skylights are solar tubes, but you can also green up more traditional skylights. Tubular skylights use a small dome to collect sunlight from various angles throughout the day. The light is reflected through a tube and diffused into a room through a fixture that looks somewhat like a standard recessed light. These tube lights maximize energy efficiency in several ways. They let in more light from a smaller opening, leading to less unwanted winter heat loss and summer heat gain. The tubes also can easily direct light into bathrooms or other central spaces without other natural light. The drawback of tubular skylights is that they don't look like a typical skylight. There is no rectangular window in your ceiling. Your cat can't watch birds fly overhead while basking in the rectangle of warm light. 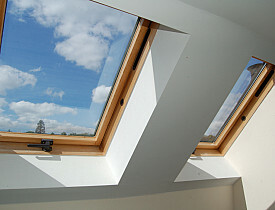 If you want a more typical skylight, consider size, location, materials and ventilation. Size: The DOE suggests skylights should be no larger than 5 percent of the floor area in rooms with other windows, and 15 percent of the floor area in rooms without much other natural light. This provides plenty of light while minimizing heat transfer. Location: The site of your skylight depends on your geographic location. In warm climates, place skylights on the north-facing roof to reduce direct passive heat. East-facing locations are a secondary option. They will heat up the house in the morning, but won't amplify afternoon heat. In colder climates, south-facing skylights can provide plenty of passive winter heat, reducing energy bills. If summer heat gain is an issue, consider putting the skylight in the shade of deciduous trees. Slope: Slope is also a crucial consideration for skylights. A flat skylight will capture high-in-the-sky summer heat while missing any opportunity for winter heat gain from a sun that is lower in the sky, potentially missing the skylight altogether. Instead, the California Energy Commission recommends tilting a skylight to an angle equal to your latitude plus about 10 degrees. For example, Denver is 40 degrees north, so a Denver skylight should be tilted about 50 degrees. Materials: Skylight materials also vary based on your location. Click here to compare the estimated energy costs of various materials. Look for double-pane glass with low U-factors. Low-e coatings and tints protect against UV sunrays that can fade and damage furniture and artwork. However, they also reduce solar heat gain, which can be an important factor in reducing winter energy bills in cold climates. Ventilation: Some skylights open to release hot air, particularly in kitchens or bathrooms. If they release steam and moisture buildup, they could also help reduce the chances of mold buildup and improve indoor air quality. To avoid water problems, look for ventilating skylights with moisture sensors that automatically close during rain or snow showers.